You may have noticed that I was almost nonexistent when it came to posting on Instagram. However, I did share several photos and videos on my Instagram Stories. From Thursday-Saturday, I attended The Blog Society Conference that was fortunately held here in Chicago. I wanted to be more present so the best way for me to share what I’ve been up to was using Instagram Story. Do you guys utilize that feature? There was so much I learned about blogging and so many amazing people I met at #TBSCON. I’ll definitely share a recap with you guys in a week or two. I’m 5’4″ but for some reason finding a maxi dress can be a struggle. Either the dress is too long or too short. I recently learned that 5’4″ is borderline petite. For the most part, I trust that my dress will shrink a little, but that is not always the case. So if the maxi dress is affordable (like this black floral one I wore not too long ago), I don’t mind getting it hemmed. However, I finally found a style of maxi dress that will work for us 5’4″ ladies. 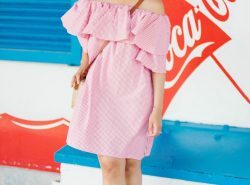 The best kind of maxi dress for semi-petite women is getting a maxi dress that is asymmetrical or has the high-low style. I came across this high-low maxi dress and the length is perfect! The shorter front gives me that elongated appearance and the longer length in the back gives it a maxi dress feel to it. I am wearing an XS and it fits comfortably. This dress has a little stretch to it (I love dresses with stretch to it. It’s like the comfort of an elastic waist pants haha!). Want more high-low or asymmetrical maxi dresses for us semi-petite women? Here are my current top 5 favorite dresses. Such a pretty maxi dress! Love the print! Oh my, this maxi dress is stunning, Rach. I truly love the way it look on you! Sounds like you had a great time at the conference! I love the look of the high-low hem, and finding a maxi dress when you are short is always such a struggle! You would look amazing in this dress! LOL you got legs for days girl! Cute! And that Bag is so unique! This is definitely the perfect dress, whenever I see a maxi dress and i try it on it is juts impossible because it drags for so long. Thanks for sharing! So much yes about this! Being 5'2, most of the maxi dresses I try on look absolutely ridiculous, and like I'm a little kid trying to play dress up in my mom's clothes haha. But these are perfect! And I love the one you're wearing! The struggle is real girl! Hopefully high-low dresses work out for you! I am always searching for a maxi that won't drag the ground. This looks great on you! In love with your dress and bag, Rachel. Perfect combo!!!! You are such an inspiration! Keep it up girlie. Aw thanks so much Len! Gah – where was this post last month when I was looking for maxi dresses? I'm 5'3, so a little shorter than you, and I have the hardest time finding a maxi dress that doesn't drag on the floor! Oh no! So sorry my timing was off!! It seriously is the best bag and goes with anything! Thank you Missy! I love maxi dress but same concern comes. I am 5'4". And truly said, hi lo can be the savior of the day! Right?! So glad it is working for you! I love that you categorized yourself as semi-petite. That's the perfect way to put it. Most of my friends are about your height and always struggle with finding the best maxi dresses that don't overwhelm them. Being almost 5'7", I never really know what to recommend, but now I can share this post with them whenever they ask me! It was the best way I can describe! Not quite petite but definitely not tall haha! Thank you Stephanie! This maxi dress is so pretty! I love the print! I can't wait to hear about the conference! That is definitely something you'd want to be present for and enjoy. I'd never heard the term semi-petite but I like it. This dress is so pretty! I'll definitely share it soon! Haha, I think I made it up! I am so in love with this dress!! I could live in dresses during the summer and even into winter!! semi-petite!! i love that phrase! That dress is so cute on you! And I NEED that bag! I saw all your stories and it was so perfect. I hope you had fun. You are so lucky I 5 just five, so any dress I buy as maxi will be so tall on me and I have to war it with a very high heels in order for me to actually wear it. I definitely did have fun! Oh no! I do hope they make it more for petite girls soon! That's a lovely dress and fab bag. I haven't been utilizing Instagram story much, but I'm considering it more and more. Thanks Inez! I've been more recently sharing it and it has been fun! Such a nice and beautiful dress you just got. Wow you look gorgeous in this outfit. Absolutely adore your maxi dress and that structure bag. Love to see more inspiring outfits like this. Happy week gorgeous. Thanks Jenny! Yup that is a struggle too! You look so lovely in this summer maxi dress and the details are perfect! love the bag and your picks! They are flattering as well! Such a darling dress! I love the ruffle along the bottom! You look so pretty! That high-low hem is perfect for girls who are on the shorter side! 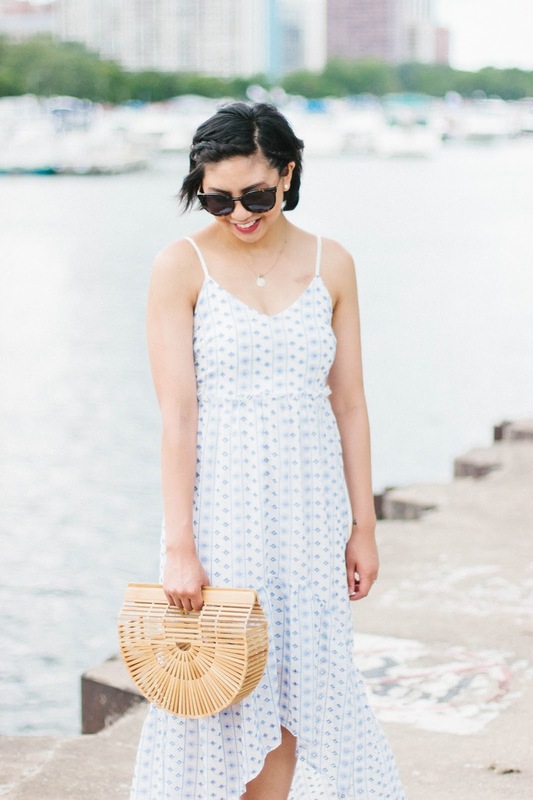 I love this super dainty dress; so pretty on you! Cute dress. Looks so comfortable. Would look great with a belt too. I'm 5'4" as well and can totally relate to the maxi dress struggle!! Right?! The struggle is real haha! Lovely dress! I have always had to hem maxi dresses. Sometimes, I'm small enough that I get child's size instead! Oh the struggle! I also have to be careful when choosing maxi dresses because of my petite size and short height. I love hi-lo hemlines because they typically don't drag for me. Loving this one you've styled! Cutest dress and bag ever! That's my favorite bag! That dress is super cute! I'm extra petite so good maxi dresses are always hard to find! I love this dress on you! Gorgeous!